These days, most of us are being bombarded by various energy saving devices that claim to help you save your electricity bills. Do they actually help to reduce our energy consumption and hence our bills? You will probably encounter these products at energy-related exhibitions as well as online and offline advertisements. In order to determine the effectiveness of these devices, it is essential for us to determine the type of electricity meters that are used in your house or factories. Most energy utility providers install kilowatt-hour (kWh) meter to measure the true power at your home. 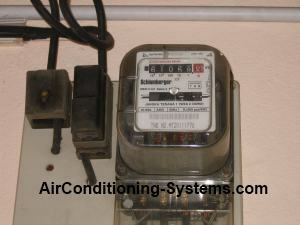 This meter is placed before the distribution board to measure the energy consumption of your house. The readings are used to determine the energy consumption and hence the bill for that particular month. If you look at your bill, the energy cost is = kWh X cost per unit. The power factor is given by kW/kVA and utility provider strives to give a near unity power factor. In factories, due to the use of many inductive devices such as motors and air conditioning equipment, the current will lag the voltage causing the power factor to drop below 1. Typical power factors are in the range of 0.8 to 0.9 without any power factor correction. If this power factor is not corrected, the apparent power will increase and the customers will be charged at a higher rate. In order to correct this power factor to near unity, capacitor banks are used to move the current phase nearer to the voltage phase hence achieving a near power unity. Hence, energy bills can be reduced by installing automated capacitor banks in factories where many inductive loads are used. There are usually two types of energy saving devices that are designed for household use. They claim to reduce your electricity bills. Capacitor Unit Application is one of the commonly devices flooding the market. Basically, it helps to correct the lagging power factor when inductive loads such as air conditioning, refrigerator and motors are used. The capacitance unit in this device helps to correct the power factor to near unity by reducing the reactive power (Var). However, if this device is used in your house and the metering used is kWh, there will be no changes to the true power (kW). This means that there will not be any savings in electricity bill. Therefore, always check the principles behind the type of devices that claim to reduce your energy consumption before purchasing them. Voltage Reduction Method is another type of device that reduces the incoming voltage supply to your house by using a solid state fast switching component. It effectively reduces the average effective voltage, hence if the incoming supply is 240VAC, the supply that reaches your equipment may be a few volts lower.This means that the power to the appliances in your house have been reduced. For instance, the lighting system may be not as bright but you may not notice it. In this case, the power consumption will drop and you will see some savings at the expense of dimmer lighting.Similarly, your appliances may require a longer time (could be in miliseconds) to operate compared to before installing the device. In this case, there will not be any savings involved. In summary, a better way to save electricity is by switching off your appliances when you are not using them. There is still some power consumed even if you put them on standby mode. Another way is to replace your equipments with newer and more energy efficient design. See more tips on energy savings here. However, if the apparent power utility meter is used in your house , the application of capacitor unit type of energy saving devices can help to reduce the electricity bill. If you have encountered a better device with other working principles, please provide your feedback and share with us your discovery.